The celebrated Hastings firm of Judges Ltd. still publishes picture postcards, although it has now greatly diversified its printing and publishing activities. It has been the subject of numerous magazine articles (especially Picture Postcard Monthly, see for example, Ron Grosvenor, "Judge's London", November 1987, 103, p. 31; Peter Tucker, "Rough seas at Hastings", June 1999, 242, 32-34 and Andrew Reynolds, "100 years of Judges postcards", November 2003, 295, 24-28) and also a centenary book (The glory of Judges, 2002, Judges Ltd., Hastings), now sadly out of print. The Judges Postcards Study Group publishes frequent newsletters (Editor and secretary: Mrs Vickie Harris, 58 Northwood Drive, Sittingbourne ME10 4QS) and is engaged in the production of a database of all known Judges cards. The present account has necessarily to be brief and cannot do full justice to this remarkable firm's great diversity of cards. The firm's founder, Fred Judge, was born in Wakefield, Yorkshire, in 1872. He was the eldest son of Harriet and Joseph Judge, a corn and flour dealer, who had been born in Lincolnshire in about 1843. Fred had four younger brothers, who were all born in Wakefield: Joe Judge in 1873, Waldron Judge in 1875, Ernest Judge in 1876 and Thomas Winn Judge in 1880. The 1881 census records that the family was living in Arundel Street in Wakefield; by 1891 they had moved to Leeds Road. Harriet died in 1890 and Joseph ten years later. Fred Judge attended Wakefield School of Art before starting to train as an engineer. The 1891 census lists him as a steam engineer's apprentice; his brother Joe was a chemist and druggist's apprentice. In 1897 he married Marion King at Wakefield. The 1901 census records that the couple had a two-year-old daughter, Marjorie, and lived in Avondale Terrace in Denby Dale Road. Fred was working as an engineer's draughtsman. Waldron, who shared the house, had taken up his late father's profession, trading in corn and flour. From an early age, Fred Judge had been fascinated by photography, and, following a holiday in Sussex, he decided in 1902 to abandon both engineering and his native Yorkshire to become a professional photographer at Hastings. He purchased an existing photographic business belonging to a Mr A. Brooker at 21a Wellington Place in Hastings, renaming it Judges' Photo Stores. His brother, Thomas Winn Judge, soon joined him as a business partner. Initially, he concentrated on selling photographic materials, producing prints of local views and acting as a lanternist at public lectures. He also hired out his "electrically lighted darkrooms". In 1903, however, he began issuing picture postcards. It is generally thought that the very first card was a multi-view of the great storm at Hastings in September 1903. Many other cards followed in 1904 including general views of the town and studies of flowers and animals. Fred Judge set himself such high standards of creative composition and quality of finish that passers-by regularly gathered outside the Photo Stores to admire the latest window displays. In the first few years he sold cards at 1d (0.42p) each or 13 for a shilling, but by 1907 the price had doubled. 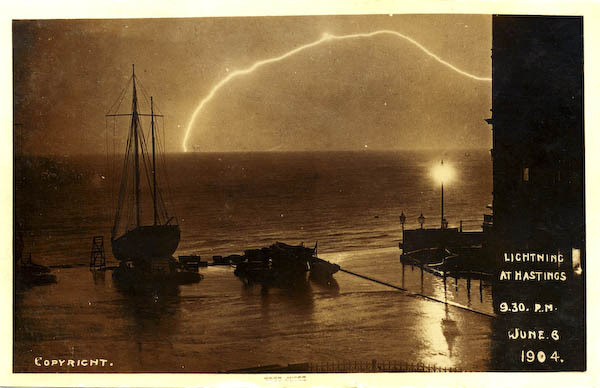 One of his early cards shows a bolt of lightning at Hastings during a storm on the evening of June 6, 1906. Within a year Fred Judge had sold 25,000 copies of the card, and it remained a best seller for a quarter of a century. Claims have been made that the picture was faked (see Geoff Harris, Judges' Postcard Study Group Newsletter, No. 91, April 2009) but over the years most commentators have believed it to be genuine. In November 1906 Fred Judge published another remarkable card, entitled "Glory", which showed Hastings Old Town illuminated by shafts of sunlight descending through gaps between lines of clouds. Over the years sales of this card are said to have run into the hundreds of thousands. Not content with producing real photographic cards, Fred Judge also experimented with printed cards. In 1906-7 he started selling some unsatisfactory coloured collotypes of Hastings and Rye, which were supplied by a German printer. Some cards were very dark and gloomy, whereas others were luridly coloured. In the years 1903-9 Judges produced many cards of special events in Hastings, for example the inauguration of the tram service in July 1905 (both a halftone card and a real photographic version were issued), the sea front flooding that followed an exceptionally high tide in November 1905, the S.S. Lugano on fire off Hastings in April 1906, the launching of the Hastings lifeboat in a snowstorm on April 25, 1908 (at least 6 real photographics), the "State Visit" of the Lord Mayor of London to Hastings on November 28, 1908 (several real photographics), and the great fire in Waterworks Road, Hastings, in January 1909. The special events cards generally lack numbers or have numbers indicating their position in a set. The Main Series of numbered cards started in autumn 1906 with the publication of No. 50. However, the numbers were applied in a rather haphazard manner for the first few years. Thus, according to Judges Ltd, No. 51 "Evening, Rye" dates from about 1903 and No. 58 "Albert Memorial, Hastings" is "circa 1905". If true, the photographs on these cards and perhaps others drawn from the firm's archive predate the Main Series. However, No. 52 "October" was definitely taken in October 1906 and No. 57 "Glory" in November 1906. By 1907 No. 351 "Summer" had appeared. In 1905 Fred and Thomas Judge began moving their growing business to "Camera House" at 42 White Rock, though it was several years before they could vacate the Wellington Place premises altogether. They claimed in Pike's 1906 Hastings Directory to be "lanternists to all the principal lecturers in the District", a claim that Angus Croyle, another lanternist and an arch-rival, would no doubt have disputed. As his postcard business expanded, Fred Judge spent more and more of his time "out and about" taking photographs, leaving his brother, Thomas, to run the shop and organise the work of developing, fixing and toning in the darkrooms. Despite his "backstage" role, Thomas was quite a talented photographer in his own right and several of the pictures he took appeared as Judges postcards, although the vast majority of the photography in the early years was Fred's work. In 1905 or 1906, Judges purchased the first of several photographic printing machine from Ellis Graber of Tunbridge Wells, which greatly speeded up the production of cards. In 1910 growing sales forced them to search for still larger premises and they moved the business to 51 Havelock Road. It was around this date that Fred and Thomas set up a limited company, called "Judges Ltd", to provide better finance for the business. The White Rock shop was sold in February 1910 to A.E. Marriott of Marriott's Photographic Stores, who obtained exclusive rights to sell Judges cards in Hastings. Judges largely stopped producing cards of local events in Hastings (a rare exception was their coverage of the fire that wrecked Hasting pier in July 1917), and instead set themselves the goal of becoming a major national publisher of scenic cards. A start had been made in 1908-9 with the production of a series of London views, including night scenes, and in 1913 Judges opened a branch at 22 Ludgate Hill. The First World War caused a major but temporary drop in business; when it was over, six more branches were created at Llandudno, Bournemouth, Whitby, Brighton, Bettws-y-Coed and Torquay. In 1920 Judges bought out Mr Marriott and opened their own branch in Hastings. In 1927 they moved into their present, purpose-built factory and headquarters on the Bexhill Road at Bulverhythe, near Hastings. The distinctive Italianate facade has become a familiar local landmark. The interwar period saw the production of vast numbers local view cards of all parts of the country, from the tip of Cornwall to the far north of Scotland. Most of the cards were sepia tinted, but limited numbers of black and whites were also issued. Despite mass production, Judges managed to maintain the high standards of finish on which they had built their reputation. With some exceptions, the cards were numbered sequentially (see table). It is generally accepted that Fred Judge took all the photographs for the first 7400 or possibly the first 7699 cards (with occasional contributions from his brother), but in 1921 Oliver Butler was employed to help with the photography. Fred ceased taking any new photographs after card 9347, apart from a Buttermere series numbered 9760 to 9841. Oliver Butler was joined by Norman Button in 1930 and then by Ernest Bartholemew in 1932. In addition to real photographics, Judges also issued greetings cards and cards of charcoal and pencil sketches that Fred Judge drew. Unlike many postcard publishers, Judges produced many non-localised cards of stormy seas, seagulls flying, picturesque corners of farmyards, light dappled ponds, sunlit glades in woods and other attractive subjects. Fred Judge had an eye for the simple beauties of nature and regretted that more people did not share his vision. "If only they could see", he would remark sadly. He could make an interesting photograph out of such unlikely subjects as seeding dandelions. By the start of hostilities in 1939, Judges had issued an astonishing 22,430 different cards. The business was scaled down during the war and many of the staff joined the armed forces. Fred Judge became an ARP fire warden and suffered severe shock in March 1944 when a bomb fell close to his guard post, throwing him to the ground. His health began to decline and on February 25, 1950, he died, aged 77. When Thomas Winn Judge died in 1952, Ernest Bartholemew took over the running of the company, introducing coloured cards. Production of sepia and black and white cards ceased in 1970. By this date the total number of sepia and black and white cards in the Main Series had reached about 31,782 (see Andrew Reynolds, "Number of cards issued per county", 2007, Judges' Postcards Study Group Newsletter, 85, 12-14)! In addition, the separately numbered L Series of London cards totalled 813. According to Reynolds, Sussex was the most photographed county with 3,813 cards (11.3% of the total number of Main Series cards), with Devon in second place with 2,490 cards (7.4%), and Yorkshire third with 2079 cards (6.2%), just ahead of Cornwall with 1,966 cards (5.8%). Trading in the 1950s and 60s was difficult, and one by one the regional branches were closed. Nevertheless, the company continued to make progress. Then, in December 1982, Ernest Bartholemew and his two fellow directors retired, and Judges was sold to a Cambridge toy manufacturer, which went into receivership twelve months later. Fortunately, Bernard Wolford, who had been appointed by the Cambridge firm to manage Judges, was able to purchase the assets early in 1984, and re-employ the staff. The Wolford family now own and run the business, which produces not only cards but also coasters, calendars, tablemats and other products. The number of coloured cards (the "C Series") that have been issued approaches 30,000. Fred Judge became a Fellow of the Royal Photographic Society in 1915, and won many national and international medals for his work. His book Camera pictures of London by night (1924) was greatly praised. Early in his career he invented a three-colour camera. Given the excellence of his work, he deserved greater recognition by the photographic community. The Royal Photographic Society never awarded him an honorary fellowship, and the Photographic Journal gave him a less than enthusiastic obituary. Modern opinion concerning the artistic and technical merit of Judges postcards is strangely polarised. Many collectors treasure the cards for their atmospheric qualities and "sense of place". Others consider that the cards are often dull, particularly the mountain and moorland landscapes, complaining that the heavy sepia tinting deadens the pictures, sometimes creating a fog-like gloom. There can be little doubt that the photographs Fred Judge took himself are more animated and lively than many of the later pictures, and that the sepia tinting was carried to excess on some cards. The general quality of the work, however, is markedly superior to that of the majority of Sussex publishers, and is of the best international standards.